Clifford Davis served as a Naval Chaplain both at home and abroad, in ships and shore bases, from 1936 until 1962. He was awarded the OBE (Military) in 1942 for his efforts to boost and maintain morale on board HMS Despatch, sailing in the Pacific, isolated and out of touch with UK. In 1959 he was appointed Honorary Chaplain to HM the Queen. But those first golden years of his life in the Norfolk Broads always drew him back to his childhood. In 1971 he wrote The Four Poplars as a memoir of those times and a tribute to the village where he had known such happiness. The trees of the title, which stood by the spot where Clifford and his chums used to bathe were a landmark, which stayed with him throughout his life. In 1943 Clifford married Joan Guy, who was serving with the WRNS at ITCRM, Lympstone where he was the Naval padre. They had six children, three boys and three girls. One boy, Simon, died in infancy. After leaving the Royal Navy in 1962, Clifford held several church posts, including Truro Cathedral, St Andrew’s Church Coulsdon, St Mary’s Episcopal Church Aberfoyle and finally Holy Trinity Church, Keith. Forty years on and 31 years after his death in 1980 at the age of 74, Clifford Davies’ family have resurrected his manuscript and entrusted it to Memoirs Books to edit and publish. 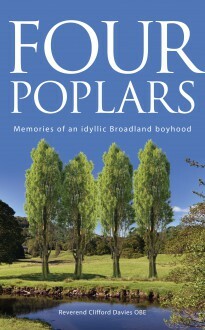 Four Poplars is an enchanting story of an England which has long gone.